Hundreds have attended the first-ever Orange Order roadshow in the Republic of Ireland. It was held in Newbliss in Co Monaghan to highlight the various aspects of the Institution and its work. The Grand Orange Lodge of Ireland travelled to Co Monaghan for the event which took place last weekend. To date the Orange Order’s roadshow has visited a number of other venues across Northern Ireland and Scotland. David Stewart, 36, who is County recruitment officer and a member of Violet Hill, LOL 571 in Co Monaghan, said it was “well received”. 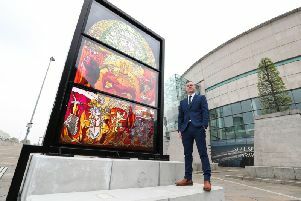 He said around 200 people attended the event where they learned more about the transformational new Museums of Orange Heritage at Schomberg House, Belfast, and at Sloan’s House, Loughgall, which both opened to the public earlier this year. When asked how Orange Order members were received in Co Monaghan, he said: “It is ok because we don’t parade in towns and villages now. The only village we parade in is Drum. “All our band parades and Orange parades are in the countryside. We count ourselves as Irish as everybody else, they say it is an Ireland of equals, but at the minute if we parade in the town there would probably be uproar from republicans. Mr Stewart said there would be around 270 members of his lodge.